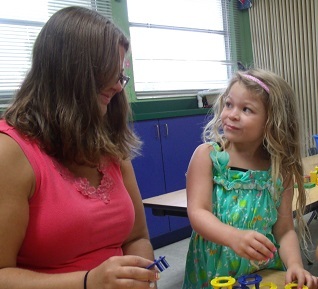 *** These part-time, preschool programs are available Monday – Friday from 9:00am – 12:00pm during the school year months of August through May. A child must be the age of the enrolled program on or before September 1st of the enrollment year. The children in the 2 year old program begin having circle time which includes the concepts of calendar (months of the year and days of the week), weather, pledges to both the American and Christian flags, prayers, letter, color, and number recognition. 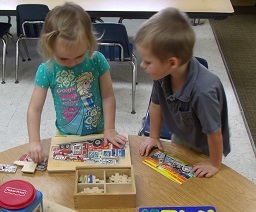 They also learn responsibility with different jobs in the classroom, and begin to recognize their names. The schedule also consists of outside time, age appropriate bible stories/Jesus time, crafts, and story time. The 2 year old classes participate in weekly activities such as Chapel, Spanish, Music, Library, and Creative Movement. Our 2-year old program is also available on a 2-day or 3-day basis. The 2-day program includes Tuesday & Thursday; and the 3-day program includes Monday, Wednesday, and Friday. The children in the 3 year old program continue to further their development with circle time, classroom jobs, outside time, age appropriate bible stories/Jesus time, age appropriate crafts, story time, and show and tell. They begin to not only recognize, but also identify letters, numbers, and begin to spell and write their names. The 3 year olds also work to take part in both our Christmas program and our Spring program by learning different songs along with accompanying movements. The 3-year old classes also participate in weekly activities such as Chapel, Spanish, Music, Library, and Creative Movement. We strongly encourage children enrolling in the 3 year old program be potty trained by the start of the school year (August) or when entering the program.